"Nintendo former headquarter plate Kyoto". Licensed under CC BY 2.5 via Wikimedia Commons. Although Nintendo is one of the most iconic brands in video game history, the company was in business for nearly a century before the NES, Game Boy, or even Mario were ever dreamed up. 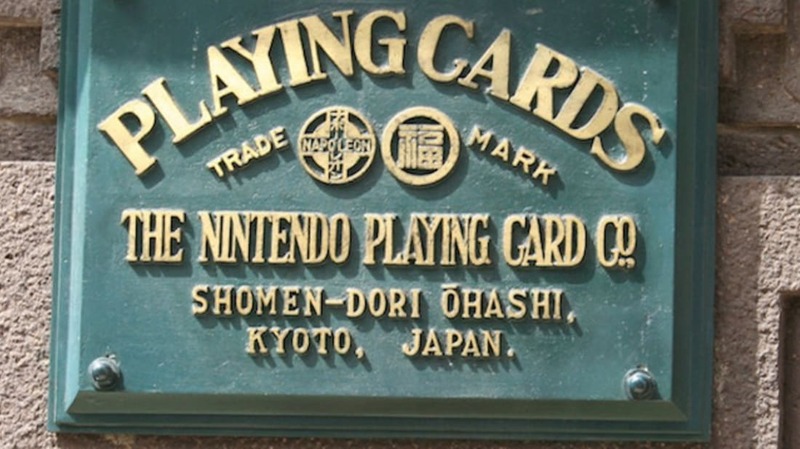 Founded in 1889, the Kyoto, Japan-based company was known as Nintendo Koppai in its formative years and primarily made different types of playing cards before branching off into toys and board games. Here are 8 non-video game products from Nintendo’s near-127-year history. One of Nintendo’s most popular playing card series was the Ehon Trump, a kind of picture book that featured TV-shaped boxes with famous Japanese cartoons and comic book characters inside (think Astro Boy and Ultraman). In 1959, the company acquired a license from Disney to produce toys and games for the Japanese market, and added such beloved characters as Mickey Mouse and Donald Duck to the lineup. After decades of producing playing cards, Nintendo expanded to the toy and game market in 1964 with Rabbit Coaster, a game in which players raced colored beans down a series of descending tracks and levels to the finish line. The game’s popularity led Nintendo to release a whole series of “coaster” games, including My Car Race, Punch Race, and a sequel to Rabbit Coaster. Struggling against heavyweights like Bandai in the Japanese toy market, Nintendo turned to up-and-coming designer Gunpei Yokoi to brainstorm some fresh ideas for the company. In 1966, Yokoi unveiled Ultra Hand, a plastic grabber toy that could expand and contract with its handles. The toy became a smash hit in Japan and was Nintendo’s first product to sell more than one million units. Fun Fact: In 1989—more than two decades later—Gunpei Yokoi also created the Game Boy for Nintendo. In 1972 Nintendo released Mach Rider, a battery-powered race car that rested on a ramp connected to gauges and a gear shift, into the Japanese toy market. When its user would shift from one gear to the next, the car would charge and increase speed while docked. Once the user shifted into fourth gear, the Mach Rider would shoot off the ramp. In 1967, following the success of Ultra Hand, Gunpei Yokoi created Ultra Machine, a battery-powered pitching machine that came with ping pong balls and a colorful plastic bat. The toy became another hit for Nintendo, and gave the company the opportunity to branch out into foreign markets. When the Ultra Machine was released in the United States and Australia, Nintendo changed its name to Slugger Mate, as the “Ultra” brand was only recognizable in Japan. Released in the mid-1960s, Magic Roulette was aimed squarely at the adult market. The sophisticated roulette game came with plastic betting chips, a playing field, metal ball bearings, and a roulette wheel, plus playing cards. Magic Roulette could be played as traditional roulette or a variation of five-card poker using five ball bearings during a spin instead of just one. In the late 1970s, Nintendo released a small, radio-controlled vacuum cleaner as a game. It was called Chiritori, which means “dustpan” in Japanese. Although Chiritori could actually pick up dust and other gunk off a floor, it was intended to be a toy, not an actual household cleaning device. Perhaps unsurprisingly, Chiritori wasn’t a bestseller for Nintendo; the company only made a limited amount of units, and the toy was discontinued shortly after its release.